Without evil, there can be no good. Without darkness, no light. Welcome to the dark side of San Angelo: City of Heroes. 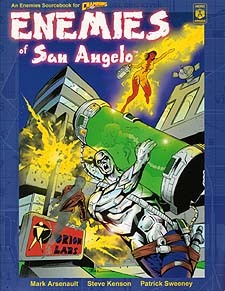 Enemies of San Angelo presents a sampling of the super-human criminals who plague the Golden City and its citizens. Thieves, killers, criminals-for-hire and villains of all kinds are detailed to embolden and enliven your Champions campaign. But in the world of San Angelo, even supervillains are people first.